Kamehameha Schools © All rights reserve. Statements of Privacy, Copyright, & Disclaimer. Mummies are not only found in Egypt. In Papua New Guinea, mummies show respect to their ancestors and are treated as if they’re still alive. Even the current village chief wants to become a mummy when he dies. What do you think about this? Other facts about mummies . . .
A mummy is a dead body that has been either preserved or naturally preserved by the environment. Natural mummification can happen accidentally or when bodies are purposely placed in spots that lead to mummification, such as caves or bogs. To be considered a mummy, the body must retain some soft tissue, such as hair, skin or muscles. Over the years, Egyptians made mummies in different ways. With one method, the body was dried by being covered in a substance called natron. After 40 days, the chest and stomach were stuffed with cloth and spices, and the skin was rubbed with oils and sticky resin. The body was then tightly wrapped in strips of linen and cloth and placed in a stone coffin called a sarcophagus. In Papua New Guinea, the Anga people make a mummy by building a smoking hut and scraping the skin and hair with a plant bristle brush and bamboo. Then they gently squeeze fluids through the skin to help dry the body. Next, they place the body in a chair made of branches and keep a fire going for about 30 days. The Anga keep brushing and squeezing out fluids. Next, they put red ochre clay on the body and last they dress the mummy in a grass skirt and cap, and place it on a breezy cliff ledge. What questions do you have about Anga mummies or Egyptian mummies? I think that it must be a great thanks for who you are to be a mummy. Why would the chest and stomach be stuffed with cloth and spices after 40 days? What is sticky resin? What does a smoking hut look like? What is red orchre clay look like? I think dressing the mummy in a cap and a grass skirt is funny. How come they whalf to put oil on the mummies skin and rub it? I learned that in papa Guinea it’s a tradition to make mummys. First the people who want to make a mummy has to scrape of all the skin and hair. second they stuff the mummy with spices and oil and cloth. Third they keep a fire going for about 30 days then they hang it of a breezy cliff. I wonder who first thought of mummies in Egypt and Papua New Guinea? I wonder if people feel less sad about a loved one dying because with mummies the people can still see them. 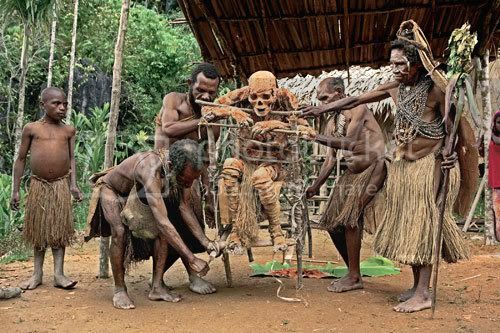 I wouldn’t like it if I saw the Papua New Guinea chief being created into a mummy. Why would he want to be a mummy? If I were the chief of Papua New Guinea, I wouldn’t like it if I were being created into a mummy. What people in Egypt and Anga was turned into a mummy? What people in Egypt and Anga actually WANTED to be a mummy? What people DIDN’T want to be a mummy but when they were dead they got turned into mummies? For the people in Egypt and Anga that wanted to be a mummy, Why would you wany to be one? Can anybody be a mummy when they die, or only the leaders? Why do they place the Anga mummies on a breezy cliff ledge? Why do they dress the mummy in a grass skirt and cap? Why do people want to be a mummy when they die? Do other cultures besides Anga and Egyptians have mummies? I think that they should test mummies before they mummified the person who wants to be a mummy. Is there a age that you have to be to be a mummy? Does a mummy have to be a man to be a mummy or a women to? Why would people want to be preserved as a mummy? Do different cultures have different ways of mummifying? Can you find mummy’s in Hawaii? Can you find a mummy everywhere in the world? I would not want to be a mummy. Next Next post: Happy Birthday Noe!